Talitha is SafeLane Global's amazing general manager, in charge of the canine training facility in South Africa. Talitha Etsebeth has been part of SafeLane Global since March 2005. She has literally shaped and developed with the company over the past years. She has been loyal and dedicated through some very challenging times. Within the first 6 months at SafeLane Global, Talitha was promoted to the position of office and financial manager due to her previous experience and qualifications in this field. After starting with Safelane Global Talitha expanded her studies to include many canine training and behavioural studies. She now has an in-depth knowledge in many areas relating to our canine operations, projects start-ups, project demobilisations, logistical support, HR support, canine and handler training and development. In Jan 2010 Talitha was appointed as the South Africa training facility general manager. At this stage the company was contemplating closing the canine branch. But with the support and trust of the company CEO who believed that she could turn the school around, she was given the opportunity to do just that – and exceeded even the highest expectations. 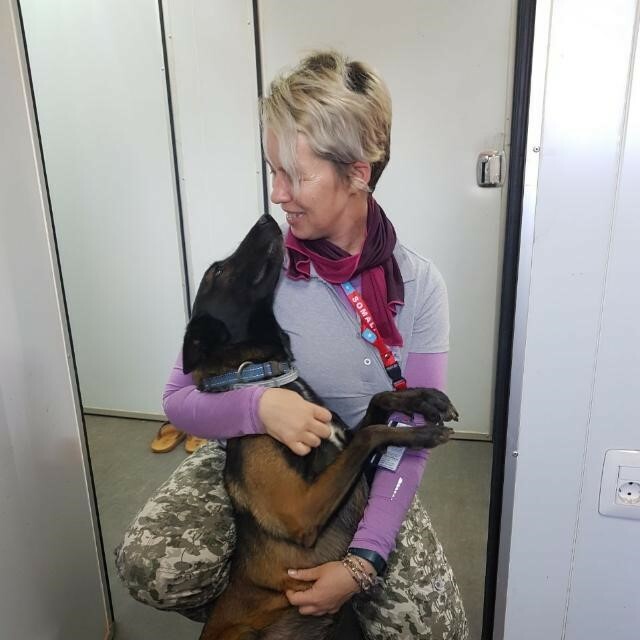 In recent years, Talitha has overseen the successful training and deployment of canine teams to Syria, Mali, South Sudan, Afghanistan, Iraq, Erbil, Somalia, Burkina Faso and Yemen. How did you come to work at SafeLane Global dog school? When I started with the company I was looking for something new, the company seemed interesting. Back then I would never have guessed the full impact this simple change would make to my life as I know it today. I am very grateful for all the opportunities and doors the company has opened to me. How and why have you developed and expanded the dog school? I was given quite the challenge in 2010 when I was appointed as the facility general manager. At that time company structures were changed, processes were changed, staff changes were made, a breeding program that was still running at that stage was closed. The company’s logistics stores that operated from SA were restructured. Overall more effective and efficient processes were implemented with overheads and redundancies being slashed. A solid base was created for stability and economic efficiency that could serve the greater goal of the company more effectively. The change included a move of premises in 2012. The new premises have been under development, for continuous improvement in our field of canine training. We started small with 10 kennels and 1 tree! We currently have an office block, 3 kennel blocks, storage rooms, 2 training fields, an extensive agility camp, 10 exercise camps – and 12 trees! Various scent walls and vehicle runs have been established too. We also make use of outside facilities during later stages of training. I can’t help but take personal pride in our dog training facility. My initial love for dogs has turned into a personal passion. I have tremendous love and respect for the dogs and the people who I work with every day. The staff go through a tough initiation and training phase to become part of the facility team. Passion, dedication and hard work are core requirements to make it here as a team member. I can be tough on staff when it comes to the training quality and care of our dogs. Thus, the respect they gain is well earned. Ongoing development in both the dogs and people are key to sustained and continuous improvement in the quality of the service and dogs we provide to our clients. We cannot be blind to the science and ongoing research for advancement in our field. This is key and will be an ongoing investment for as long as I have the privilege of managing and running the canine facility. We aim to stay relevant and ahead of the curve in a very competitive environment. The training aspect of the facility took a radical turn around 2013. Under my guidance and with great support from CEO Adam Ainsworth and Chris Clarke. This has been a huge area of focus for improvement and development. With the help of a long list of developing experts in this field, the facility has adopted and implemented a modern and progressive training methodology, that correlates to years of practical experience as well as the latest research and developments in the market. Training is positive, uplifting and based on co-operation between trainer and dog. The mission is quality. Describe an exciting or challenging project please! It is hard to single out one. The process of building and developing the new facility was very exciting and rewarding. This has taught me about the value of teamwork and shared goals. We have had two extremely big contracts recently with 110 dogs in training at our training facility at the same time! We had handlers in training, mostly from Uganda, Zimbabwe, and Burundi, support trainers at our facility from of course South Africa, Hungary, Sweden, Finland, Portugal, and England. What a cultural mix to manage. Another amazing challenge we faced and met square on was our facility being granted the almost unheard of temporary quarantine status for the emergency demobilisation of our canine teams from South Sudan. This was a unique situation and such an extension by the Dept of Agriculture speaks of their trust in our facility; something for which I am hugely proud of the entire team here, and grateful for to the Department. For the past 2 years my duties have included project travel – visiting operational sites as part as the company’s goals, to make sure that canine maintenance training levels, canine welfare and staff development are actively pursued and monitored across the board. I have conducted several QA visits and support of providing and ensuring high quality service to our clients. 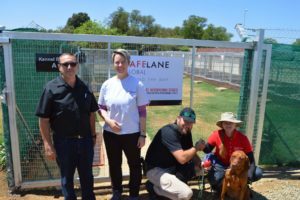 The canine training facility is at the core of SafeLane Global’s entire canine service. I feel lucky that we get to meet, share and support so many different people from across all our projects.